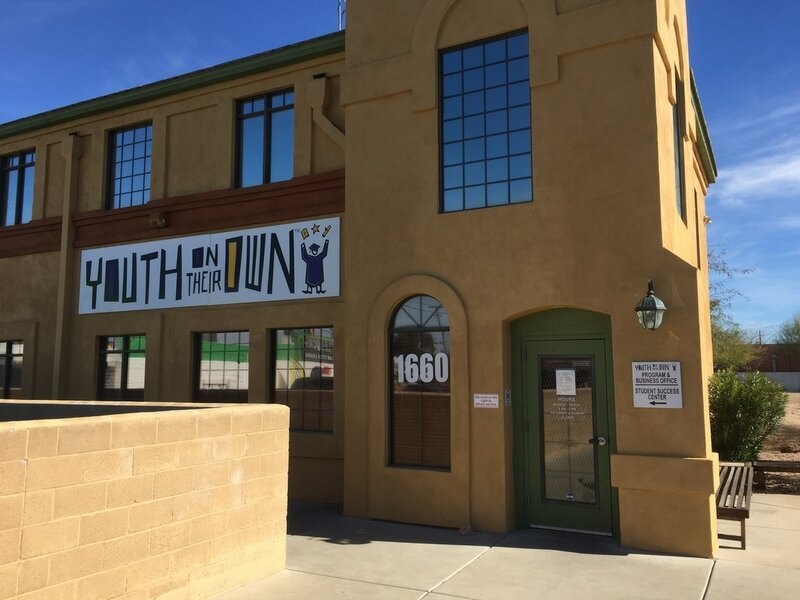 Youth On Their Own (YOTO), a Tucson based non-profit agency, is dedicated to support the high school graduation and continued success of homeless youth by providing financial assistance, basic human needs and guidance. YOTO youth, through no fault of their own, lack a parent or long-term legal guardian physically involved in their lives, and a stable, permanent nighttime residence. Students served are in grades 6 – 12 in the Greater Tucson region including Metro Tucson, Oro Valley to the north and Sahuarita to the south. These motivated young people cannot depend on their parents due to parental substance abuse, death, incarceration, abuse, or extreme poverty. Today, high school graduation is a vital step toward self-sufficiency and creates the well-being and opportunities in adulthood that break the cycle of poverty and reliance on social services. The YOTO facility offers students a study area with computers to complete homework, and a mini-mall to get needed food supplies and personal hygiene items. Donations can be made at our Mission Table in Fellowship Hall and/or placed in special offering envelopes ($10 or $20 for each card) and designated for YOTO Gift Cards. These can be left at the Information Table or in the church office. YOTO has a drive in late summer to provide backpacks to students as they start a new school year. A donation of $25 will purchase a backpack with basic school supplies. Larger donations will be used to add additional items to a backpack to make it suitable for either a middle school or high school student. The new Resale Home Store is located right next to the YOTO site at 1642 N. Alvernon Way. In addition to the dollars benefitting YOTO from sales, YOTO students have an opportunity to participate in the store’s internship program which blends both academic work and practical, hands-on experience. Find out more by clicking on www.yoto.org to visit their site.